Kelly Ramsdell Fineman is a poet and author of stories for children. Her first picture book, At the Boardwalk, came out in 2012 from tiger tales press, and was illustrated with amazing diversity and skill by Mònica Armiño, who lives in Madrid, Spain. Kelly does not live anywhere quite as exciting as Madrid, Spain; she lives in Williamstown, New Jersey, with her sweetheart and a calico cat named Kismet, who was found by chance along a roadside. She keeps a blog called Writing & Ruminating which just celebrated its ninth anniversary/blogiversary and includes features like Jane Austen read-alongs, lots of Shakespeare and poetry posts, and a rather recent series of posts on downsizing. 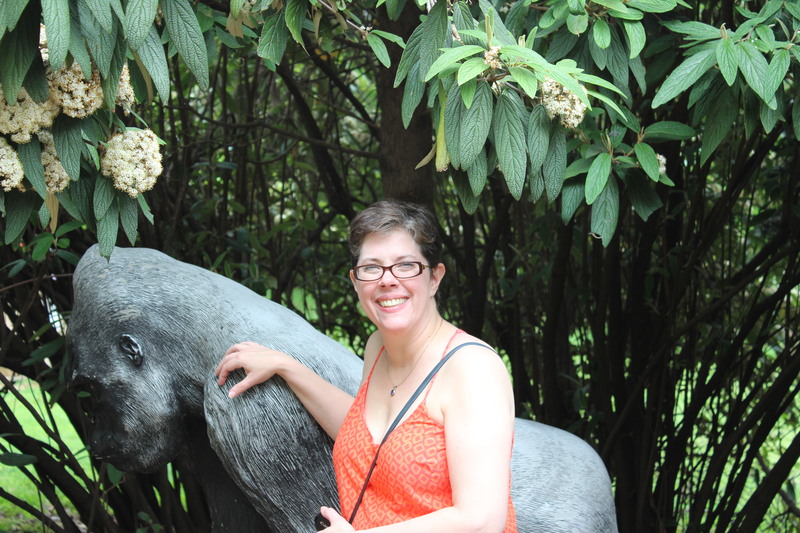 Kelly’s work has won awards from Writer’s Digest, and has appeared in anthologies for children including National Geographic’s Book of Animal Poetry and Dare to Dream . . . Change the World, in anthologies for grownups including Breaking Waves: An Anthology for Gulf Coast Relief, The Omnibus of Doctor Bill Shakes and the Magnificent Ionic Pentatetrameter: A Steampunk’s Shakespeare Anthology, and Mountain Magic: Spellbinding Tales of Appalachia, and in a number of poetry journals including Chantarelle’s Notebook, The Raintown Review, and U.S. 1 Reports. Kelly enjoys cooking, tai chi, and, of course, reading. And now, hopping along to me. I just finished polishing up three picture books, readying them for submission. For the rest of the summer, I’ll be fast-first-drafting a middle-grade novel. This WIP will be my first attempt to weave a layer of magic into a novel. (When I thought about it, I realized there’s some fantasy in every one of the picture books.) I think it falls into the magical realism genre. I’m very excited and, oh, you know, just the littlest bit nervous, about making sure I get the rules of my magic right at the same time as I don’t bog my readers down in those rules. Well…okay, so, it’s written by me. I’m not sure there are any other differences. At some later stage in my writing path, I may find myself aspiring to break through genre walls and into new territory. Today, I’m still working very hard to write the most tightly constructed story I can, with characters who are real and layered and who will keep readers turning page after page. I am, in my own role as a reader, absolutely blown away by the new-territory writers whose books I discover, but I there is a beauty to a story that, within whatever genre it fits, is done right and done well. For now, that’s what I’m aiming for. The first reason is that I write for children, because approximately 98% of my reading for pleasure is children’s books. I know I am a grown up, and I definitely participate in a grown-up world, but–for whatever root psychological reasons–when I go into a book I want it to be for children. That does also include YA, although I lean more toward the younger YA than the older. The second reason is that I find the transformative power inherent in every childhood choice to be amazing. Of course, I know that adults change as they age–it’s very possible that I’ve changed more in the last twenty years of my own life than I ever did in the first twenty. But so much of childhood is trying to figure out one’s self, and trying to do it within the restraints of the adult-created world around you–trying to do it despite those restraints. I think it’s easy to think that the choices young kids make are easy, or that most of them are made by adults, but I don’t think that’s true, and I don’t think most children believe it. Anyway, it’s these early choices and changes that I’m pulled to explore. Today? Or yesterday? Two weeks ago? I truly wish I had a process that worked consistently for me and my stories. I think it may work best for me to dump out a first pass as quickly as I can and then revise, revise, and revise. I say this, because the best writing experience I’ve ever had was the MG novel that I first-drafted in a week and then took apart and rewove over and over again. And, really, that’s what I do when I write a picture book. I toss anything, even just a long, non-dramatic description of an idea, onto a few pages and then start over with it. The one time I tried to write more slowly and think things through as I went, I got so tangled and confused that the novel is sitting in a binder on a shelf, waiting for another day when I’m a different writer and can try to make repairs. For the magical realism MG, I’ve done about the most basic plotting possible, and my goal is to have the first draft written by the end of the summer. (I’m working at a job-job these days, so a one-week first draft probably isn’t going to happen.) I’m shooting for that feeling when you push away all the questions and problems and just write, absolute garbage that will, hopefully, have a gleam of a story in it to work on. I’m tagging two bloggers whose writing I love. Joyce Moyer Hostetter is the author of some of my favorite historical novels, especially Healing Water. She lives in the South, so we haven’t ever met in person, but I have high hopes that we will some day. Joyce always has a supportive word, especially for those of us who have ventured into historical research and writing and who know the feeling of getting a little lost, sometimes happily and sometimes not so much. On her website, Joyce says, “The stories of the past belong to us if we make them ours. As a writer, I love scrounging through history’s images and finding hidden stories that have been lost in the bottom of the pile. My books are a way of bringing history into my experience. And hopefully, into yours also.” Take it from me–they do. Joyce blogs at The Three R’s–Reading, ‘Riting and Research. Alex Villasante is another writer who, as far as I’m concerned, lives too far away. I met her at the fantastic Pennwriters conference, and we’ve continued to chat back and forth and share our writing across the country. Alex lives in the semi-wilds of Pennsylvania. She holds an MFA in Fine Art which (according to her, not me!) was fun to acquire but fairly useless for gainful employment. She writes Young Adult and Middle Grade books about misfits, magic, and identity. The book on which she is currently working takes place at the beach in Avalon, New Jersey, and may or may not contain fairies. Alex is represented by Barbara Poelle at the Irene Goodman Literary Agency. Alex blogs at Magpie Writes. thanks for the tag, Becky!